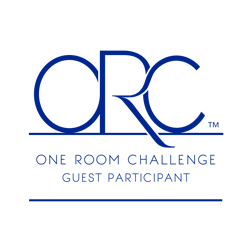 Is it really week 5 of the One Room Challenge?! Time has seriously flown by these past few weeks. I kinda hate when people say “I’m really busy” (because we all are!) but I really have been! Blogging consistently (and working full time!) is no joke – especially when you are actually creating the content you share. 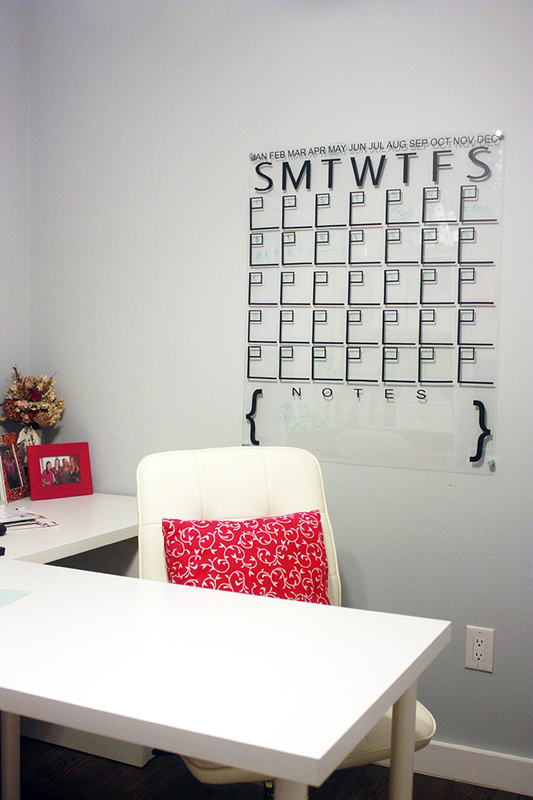 This week I’m sharing another update to my home office – a DIY acrylic calendar! 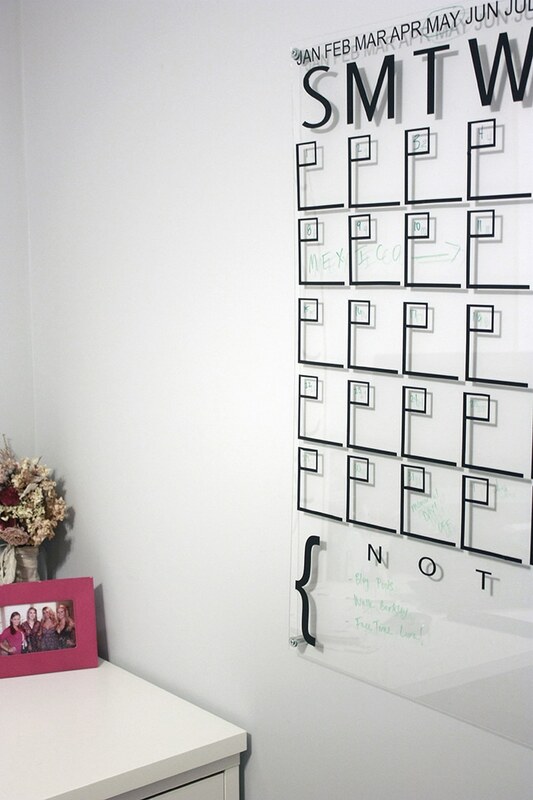 I was planning on doing a gallery wall (and I still may) but this DIY acrylic calendar stole the show. 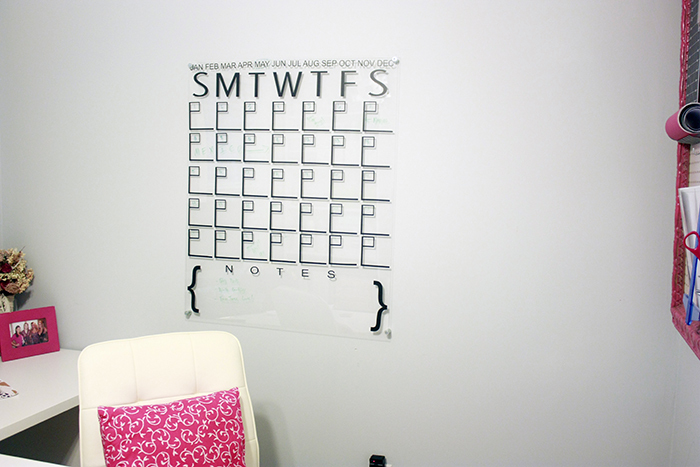 A while back I shared a roundup of wall calendar ideas. 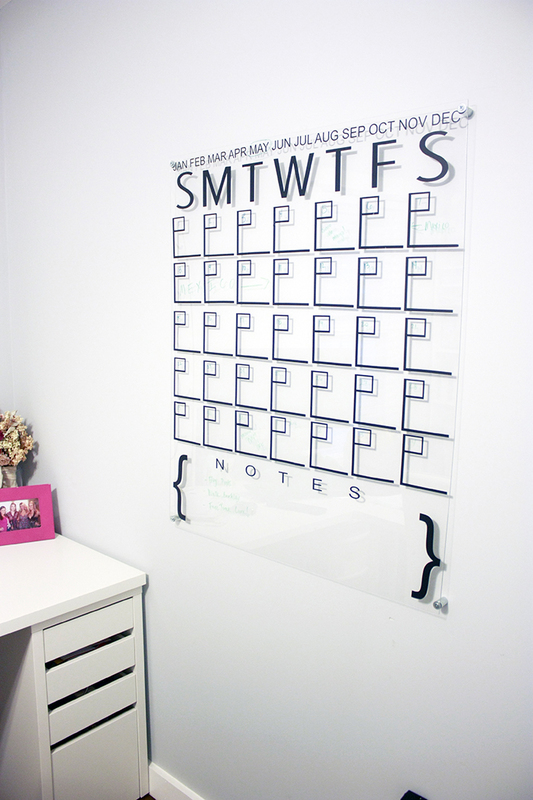 On there I shared a link to a lucite calendar that cost over $1,000!!!! 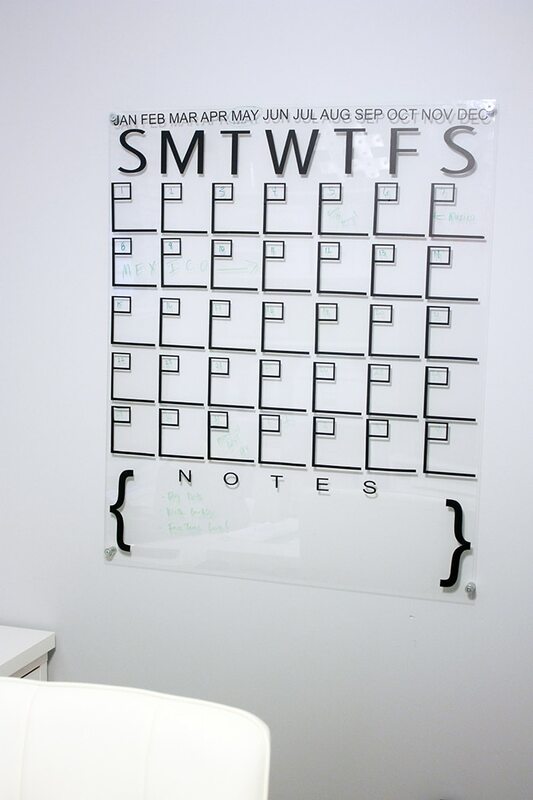 I knew there had to be a way to make your own so I checked out the hardware store and found you can get a 30×36 sheet of acrylic (AKA Plexiglass – Plexiglass is a brand name for a type of acrylic) for less than $30! Ummm hellooooo DIY….. 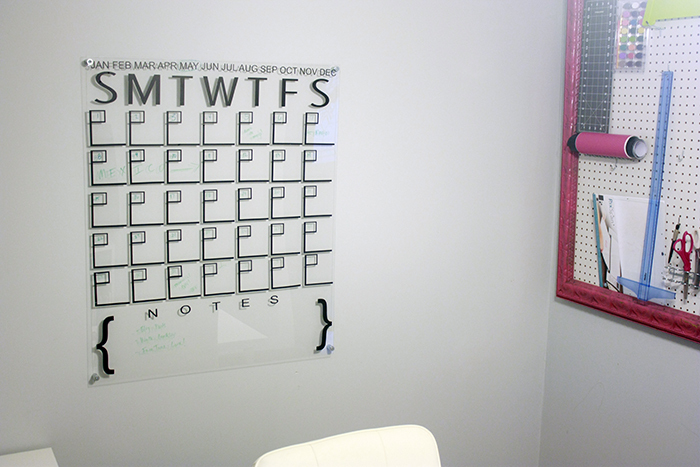 I bought the sheet of acrylic last fall and have been dying to get this DIY acrylic calendar together! 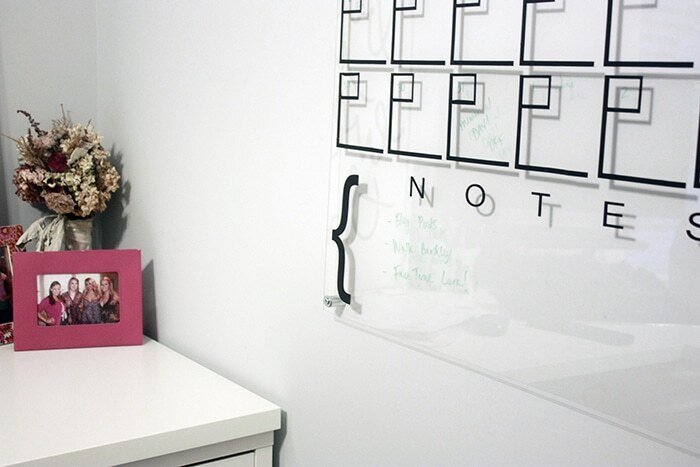 This project was actually pretty simple. After coming up with the idea, I found that Classy Clutter had already done a similar project and shared it on A Beautiful Mess! There’s no point reinventing the wheel, so I used the Silhouette Cameo cut files they shared to cut out vinyl for the calendar. 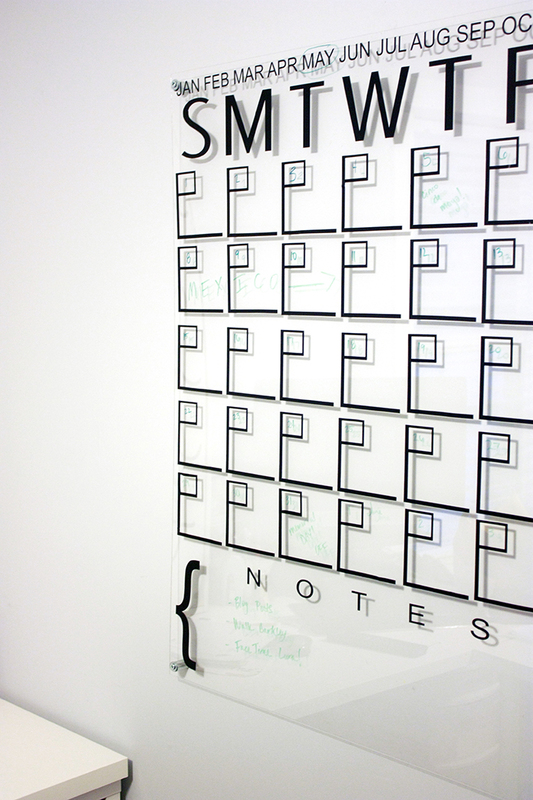 If you don’t have a Silhouette Cameo YOU NEED ONE, but you can also purchase the decals here. 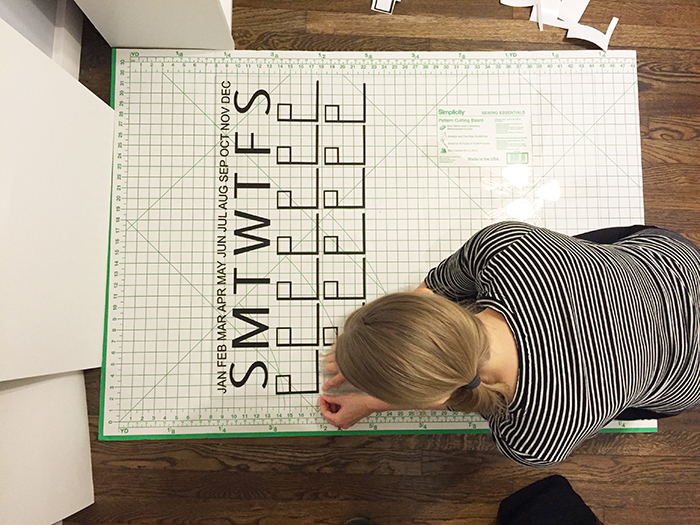 I placed the acrylic sheet on top of my cardboard pattern cutting board so I would line up the vinyl pieces easier. This made a huge difference! 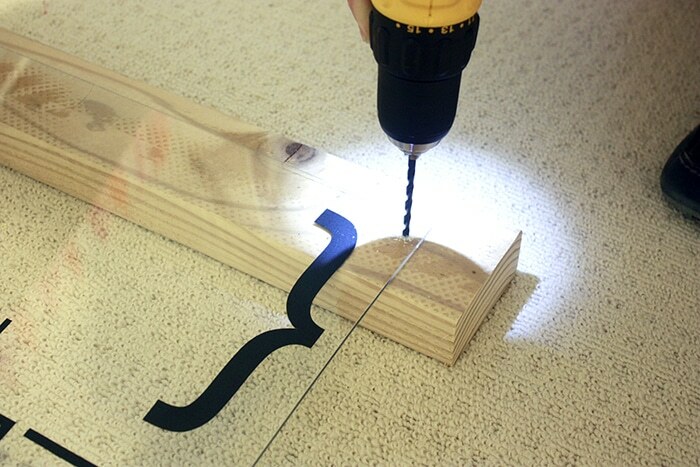 To mount the calendar: use a drill bit in reverse to drill a hole through the acrylic. We put down a board behind to protect the carpet. After you’ve made the hole be sure to clean up the plastic pieces. We pre-drilled the holes in the wall, then came back and put 1/2 inch couplings and 1/2 inch washers in place before screwing all the way in the wall. Check out a full tutorial here. 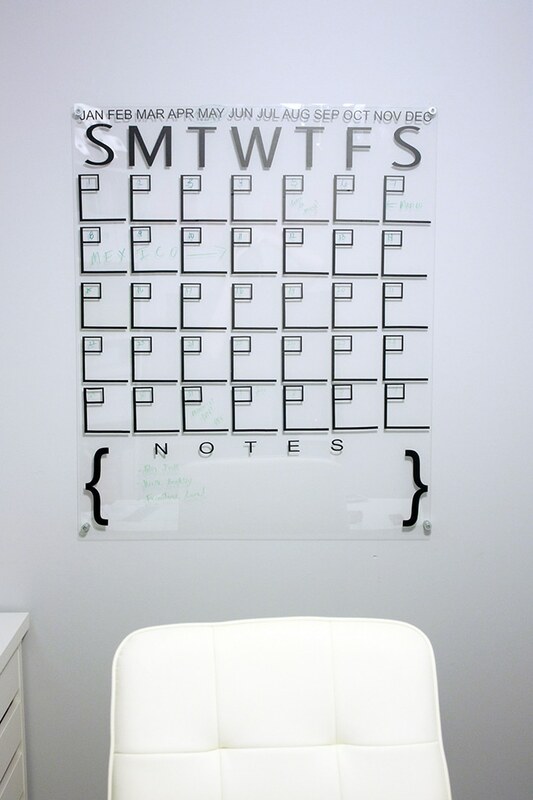 Be sure to check out my FULL OFFICE REVEAL! 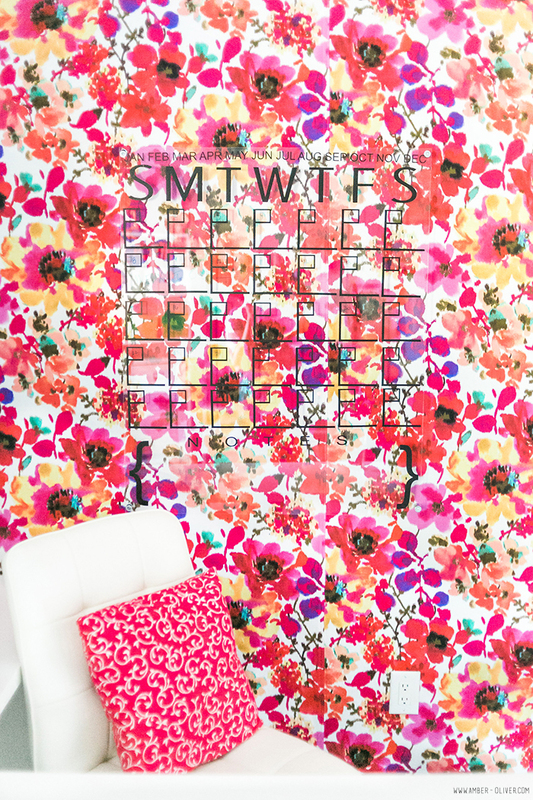 How awesome does this DIY Acrylic Calendar look on that FABRIC covered wall? Hi! I noticed in the original turtorial from A Beautiful Mess they used acrylic sheet with .22 thickness and you used .93. 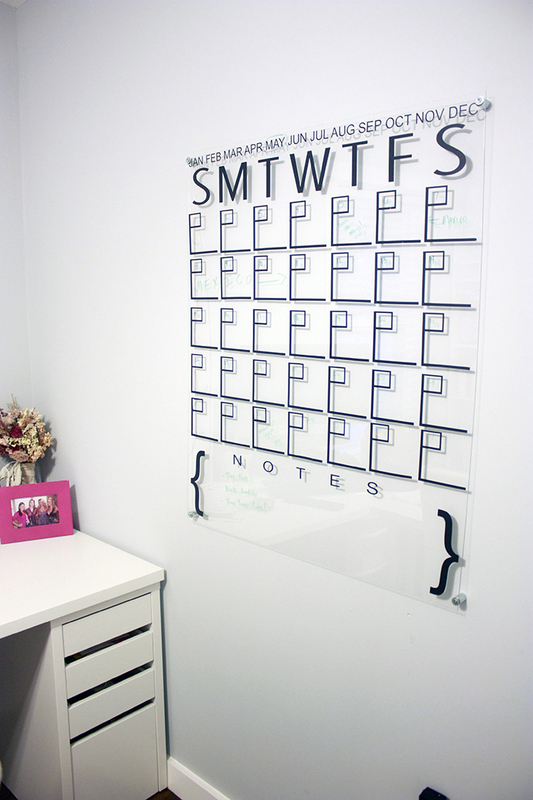 It makes the acrylic more cost effective to use the thinner option. Any downside? Are you going to eventually do the painted rug ?? Sounds very interesting . 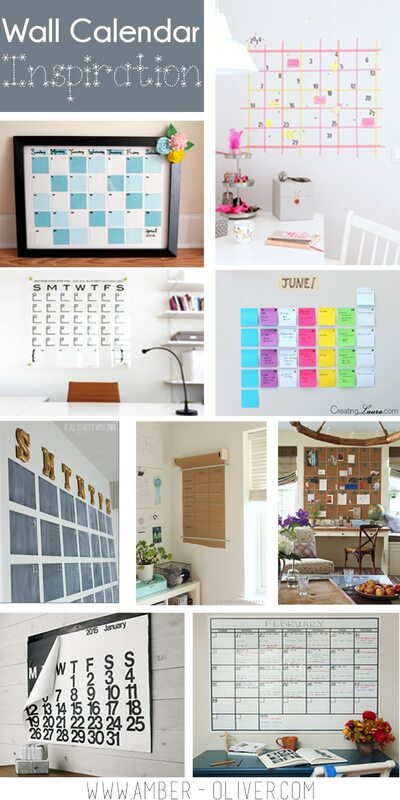 I truly loved all your diy ideas, but now I have a lot more ideas for my craft room. Thank you so very much!